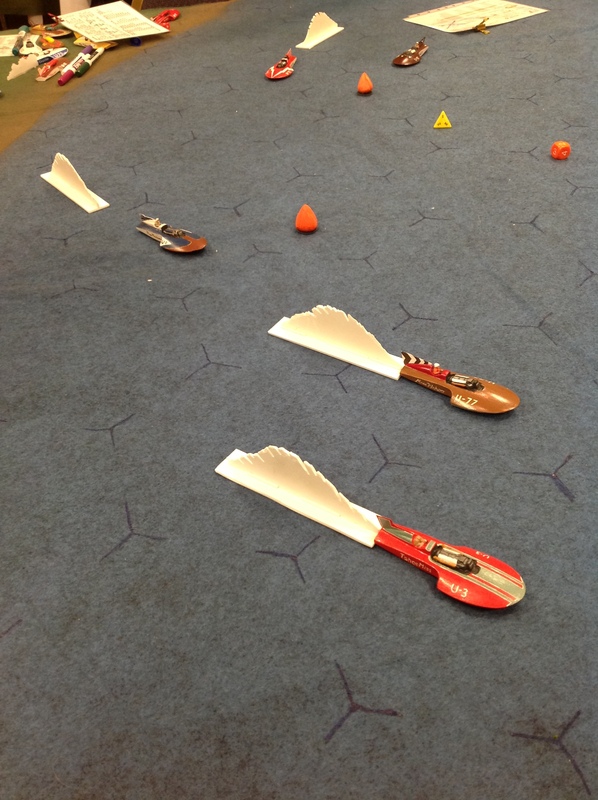 I ran a pair of racing games at Enfilade. 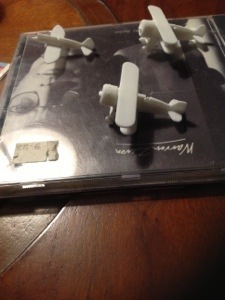 Friday night I pulled out the inaugural race for my Shapeways planes. Saturday night I hauled out the hydros for a Thunderboats! game. Both were quite fun, and I have lots to share about both. I run Golden Age Air Racing at the Museum of Flight each year, so my planes are often out where the public sees them. However, I don’t often bring them to Enfilade. It requires three large tubs to hault the 1/48th planes around, and I often have a carful of other stuff to bring to the convention, so they’re easily left at home. Not so much the 1/144th planes. Just a single tub for the pylons, and a smallish plastic box for the planes. I made space for seven racers and with 12 planes let everyone make their choices. Some were veterans, like Doug, Arthur, and John, while others were noobs, like Jeff and Owen. For some the race started off with a bang, as racers went full throttle at every opportunity, while others pushed every corner. Others took a little time to get oriented. By the end, however, everyone was madly screaming for the finish line. Jeff Condon won the race on the final turn, and I doubt he’ll ever miss any race ever again. Odd fact–Bruce Harborne suffered an engine stall on the second turn in all three laps. That’s a tough way to win. With the race over on Friday night, I decided to enter the three Gee Bees in the painting competition, and they won in the aircraft category. That they had no competition means little to me. Saturday was the Thunderboats! night. There was some buzz about the boat race. I’d run into Sean the night before and he told me he had some new boat miniatures he’d brought to the convention. Picklefork hulls from the 70’s and 80’s, but still pre-turbines. He showed them to me, and they were absolutely beautiful miniatures. I promised to buy six of the boats on race night. I made sure Sean got into the event. Chris’s Tahoe Miss passes Jeff’s Miss Wahoo, while Nick’s Miss Madison follows closely. When the event arrived, it was filled mostly with those who hadn’t raced before, including Jeff, Nick and Darcy. But there were some cunning veterans like Chris, Sean and John too. I had a feeling it could get wild. And it did as Henry Sr. and Henry Jr. burst into the lead. Both Henrys lit up their nitrous bottles early and took an early lead as Junior promptly set himself on fire. He put it out quickly, but both busted quill shafts early and fell out of the race. John was driven out with a bad hull bounce. After a rocky start, Chris eventually took a lead he would not relinquish, but barely edged out Nick who had a stupendous finish. A late stalled engine put Jeff out of the running and Sean and Darcy battled to finish. All agreed the game was a lot of fun, and that’s all we can ask. I’ve pledged more games for the near future. 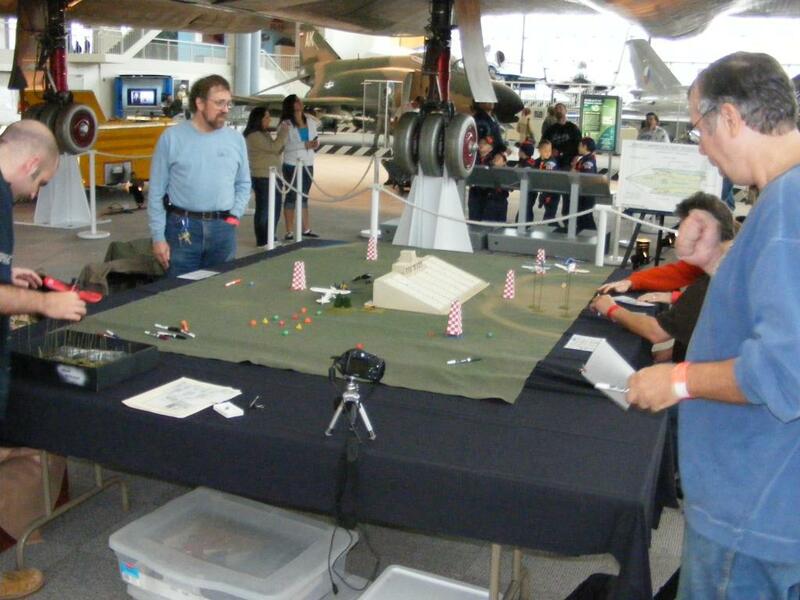 4 Comments Posted in Uncategorized Tagged air racing, conventions, Enfilade, hydroplanes, miniature wargaming, Thunderboats! 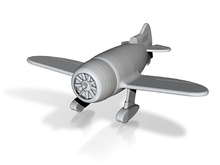 I ordered three more air racers for Enfilade from Arctic Skunk on Shapeways. They are the three newest models and welcome additions to my growing collection. First, I picked up Howard’s initial entry into racing, the “Pete.” I already have the “Mike” and I keep thinking Daveshoe will order the “Ike” to complete the trio. 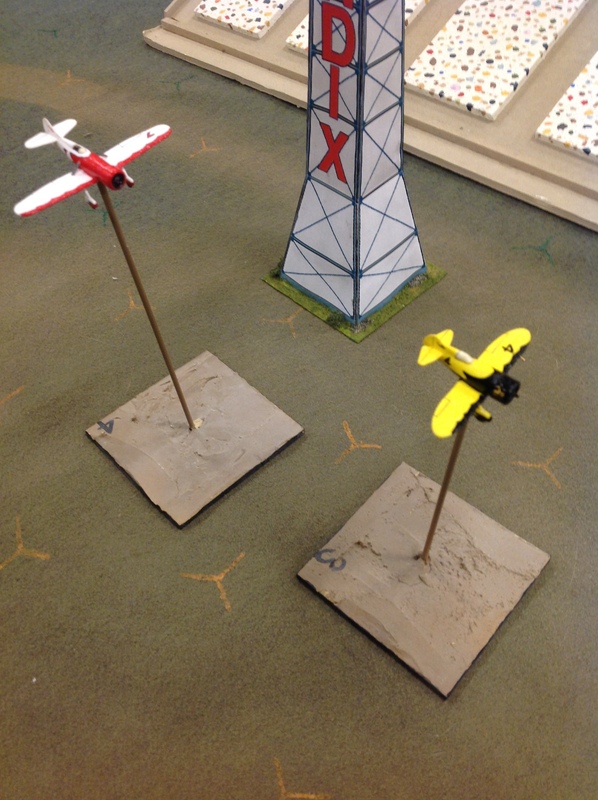 The other planes are both Laird racers. The first is the Laird Solution. In 1930 it was a helluva racer and was among the last effective bi-planes, winning the Thompson Trophy. However it’s powerful antecedent, the Super Solution, raced the following year and finished first in the Bendix Trophy cross-country race. From top to bottom are the Super Solution, Solution, and “Pete.” I added the second picture to give you an idea of size compared to an excellent Warren Zevon CD. 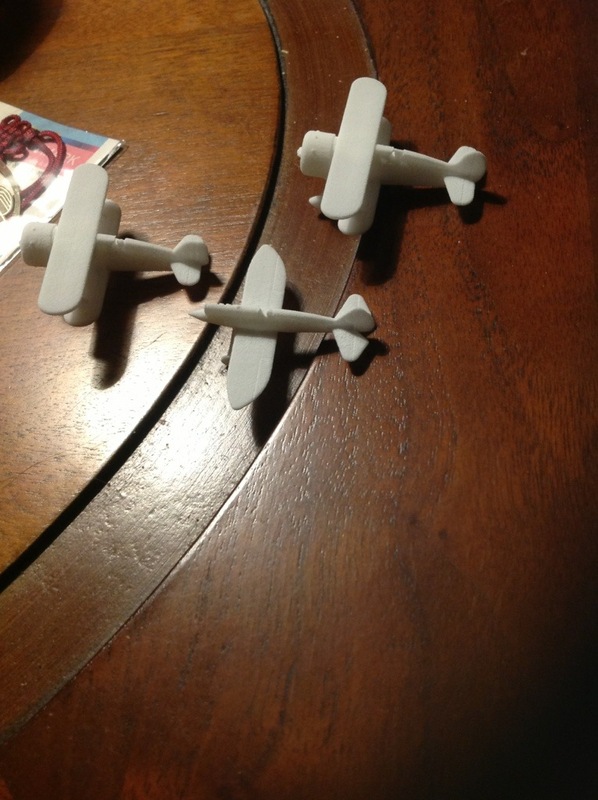 The last of my Shapeways planes are Gee Bees. 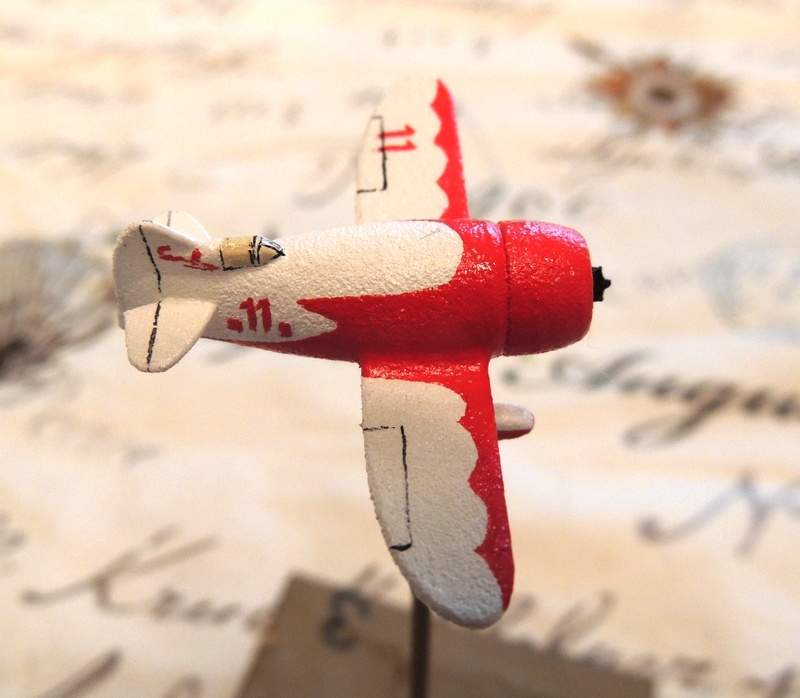 Gee Bees are air racers built by the Granville Bros between 1929-34. They are perhaps the iconic air racers of the Golden Age of air racing due to their unique shapes and flying colors. Sort of iconic like a black widow spider is iconic. The Gee Bees eventually killed or severely injured all their pilots. The reason there were no Gee Bee’s built after 1934 is because the Granville Brothers went bankrupt. It’s a well designed, well cast miniature. Though it lacks detail, it just requires some photos and a little effort to make it usable. The most fun of the Gee Bees to paint. You can see the much longer wings and fuselage than the purpose built racers. 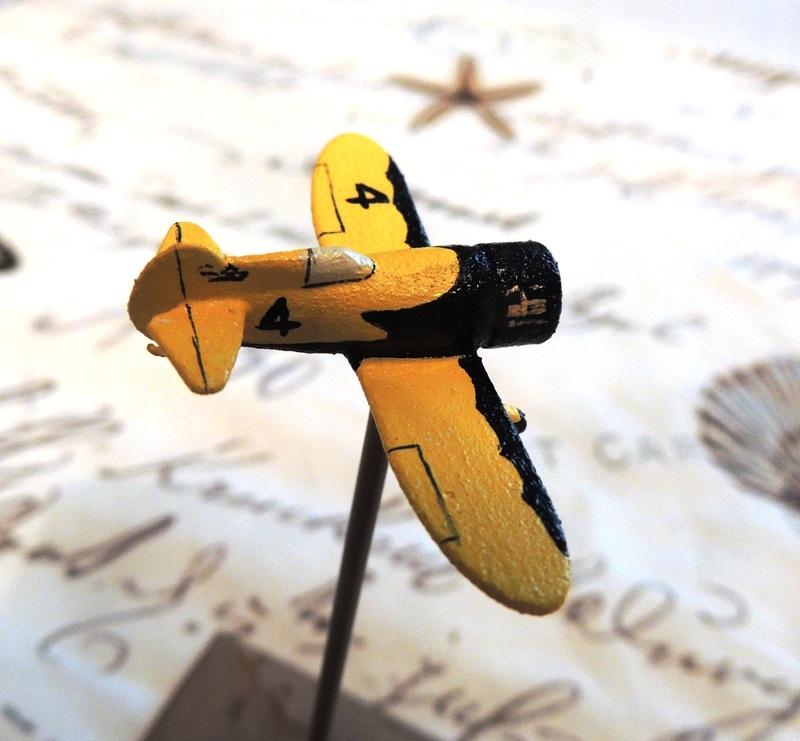 The fuselage length of this miniature is about 1 3/4″ and the wingspan is nearly 2 1/2″. 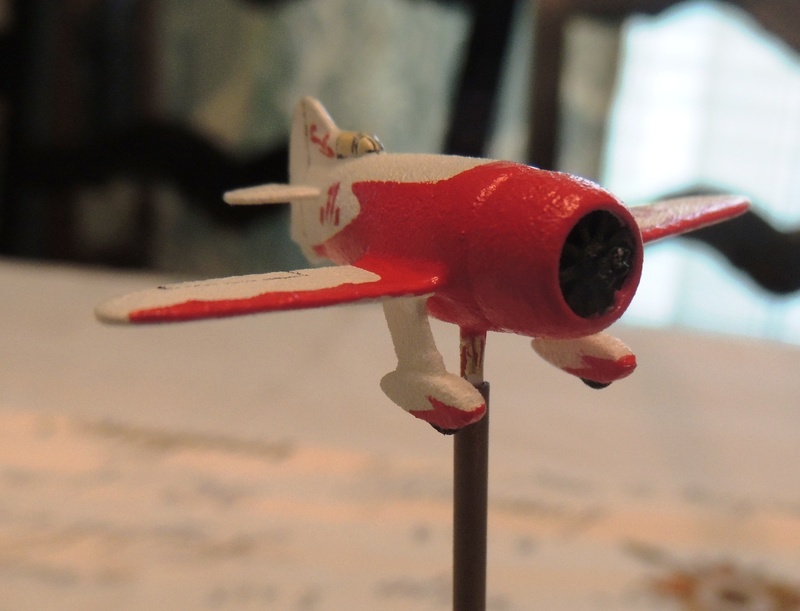 The Granvilles built two Gee Bee Model Y’s, called the “Senior Sportsters.” Shapeways designer “Arctic Skunk” offers three version of the Y. Mine is the 1931 version with the 215 horsepower Lycoming engine. This plane was lost when it’s propeller flew off over New York City, and its engine vibrated loose. It crashed in the ocean, but the pilot was recovered. The second Y raced in the Chicago Nationals in 1932, finishing second. The following year it appeared up-engined, with a 450 h.p. Wright Whirlwind. This version killed pilot Florence Klingensmith at this same event. All the Gee Bees had unique and interesting markings. Due to the small size Doolittle’s dice are hard to show. The best known Gee Bee is the R model “Senior Sportsters.” R-1 was flown to victory in the 1932 Thompson Trophy Race, by Jimmy Doolittle. It also won the Shell Speed Dash. In 1933, the R-1 crashed, killing pilot Russell Boardman. The second R, R-2, was not a winner and crashed in 1933, seriously injuring pilot Jimmy Haizlip. As if the Granville’s hadn’t had enough, the remains of both planes were reassembled into the R-1/2, lengthening the fuselage. Unfortunately that wasn’t enough to save pilot Cecil Allen, when the plane crashed in 1935. 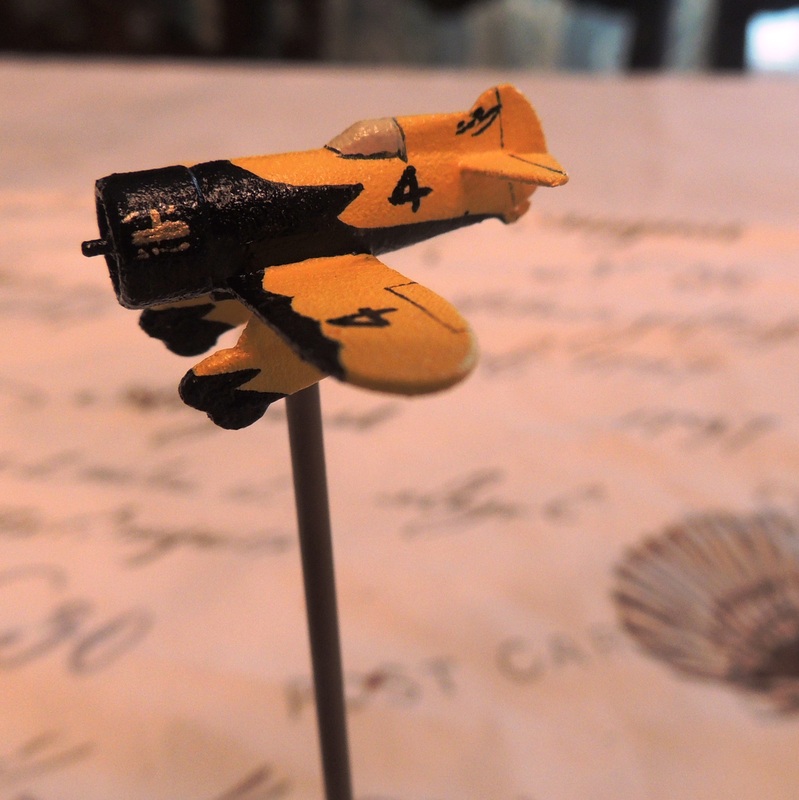 The Gee Bee Y and Gee Bee R-1 are painted similarly. I used Vallejo Vermillion and a white craft paint. I decided against adding struts to any of the planes. First, the models are really small. They also limit what can be done on the fuselage and wings. Because each of the three planes had important parts of their paint schemes where the wire should go, I decided against. On a bigger model, absolutely, but on this small version, nobody would notice anyway. All photos were taken with a Nikon Coolpix P510 with macro settings on. From the closeups you can see how rough the resin surface is, which makes detailing a bit of a challenge. Heck, the lines looked straight with my reading glasses on. Tomorrow is the annual NHMGS day at the Museum of Flight. I’ve written about it many times on my old blog. It is probably my favorite game event of the year because we’re under an SR 71 in the Great Hall of the Museum of Flight and it’s frickin’ amazing. We have lots of time to rub elbows with the public. There are lots of games to take a look at. I get to hang out with Dave Schueler and Mark Waddington. Oh, and I run the air racing game in the morning. (Because I schedule the show and keep the list of games, I can schedule my game whenever I please. Bonus. Air racing is the one semi-demand the museum puts on us for the show. That and arriving early we get set up before the public arrives at 10:00. I love air-racing. It’s a lot of fun. 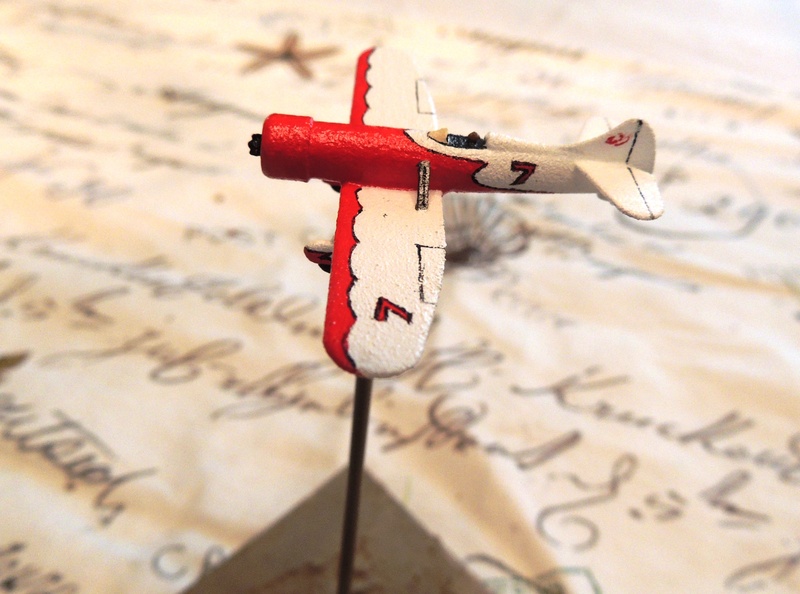 I have a collection of planes built and painted by Paul Hannah, Dave Schueler and myself. They are 1/48 scale kits, and the planes look great. Some are the old Testor’s kits that were introduced by Hawk fifty years ago. Some are a bit more upscale and include the Minicraft Seversy racer, and I even have a nice resincast Me-209 which was a test bed world speed record holder. I really like the racers. Unfortunately they are a lot to transport, and because we have to transport them quite a distance from the parking lot, they can be a lot to schlep. It will rain tomorrow, and with several trips to get everything in from the car, it will be an unpleasant walk in the weather. Worse than that however, is my constant fear that we’ll have accidents on the tabletop. 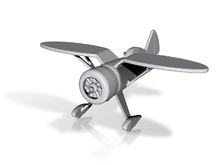 Mounted on flight stands 1-7″ tall, the planes become top heavy. In a crowd, watchers can inadvertently brush them and knock them to the table or the base, and if that happens, it’s over. That happened once at Enfilade with our seaplanes and that was pretty much the show. They haven’t been out of the box since. 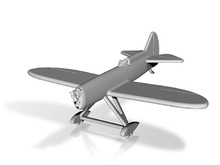 Dave and I have often talked about our wish that someone could make the planes in a more manageable scale, say 1/144th. The racers are relatively tiny at that scale, small, save weight and all that. John McEwan at Reviresco made a nice mini of the Travelaire Mystery ship ten years or so ago in that scale and I always hoped he’d follow it up with more planes, but none have been forthcoming. At that size the bases would be heavier than the planes and they’d be smaller to transport though they wouldn’t be quite so eye-catching. If only they were available. I was very pleasantly surprised when Dave sent me an e-mail last week with a link to Shapeways. 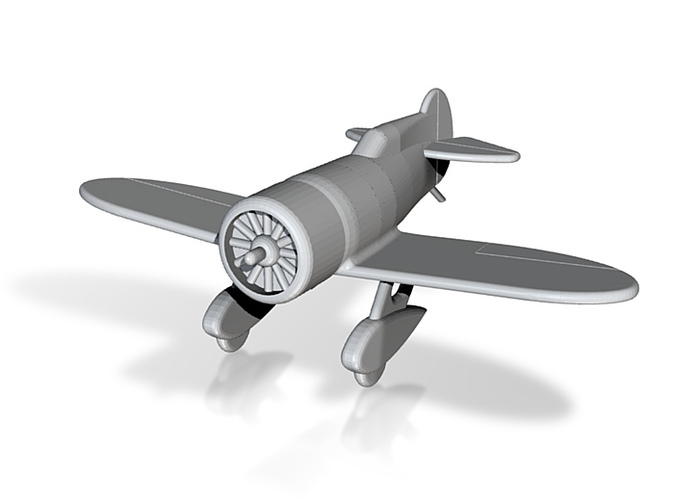 Shapeways is a 3D printing company that converts designs submitted to them into 3D miniatures. Lots of game topics, but amazingly one of their designers, Arctic Skunk, supplied them with some air racing designs in 1/144th scale. The Howard Ike and Mike are available. The Gee Bees are available, models R, Y and my favorite, the Z, and more. I don’t know how they’ll paint up, but they look pretty basic and interesting. There are pretty close to a dozen planes in the range. (Don’t get stuck on the category for Golden Age Air Racing, more are available.) They aren’t cheap, though not bad. The smallish Ike and Mike are four bucks, while the bulky Gee Bees are more than twice as much. Of course, if you want the super detail material instead of the basic white and flexible resin, you pay more. About three times as much. 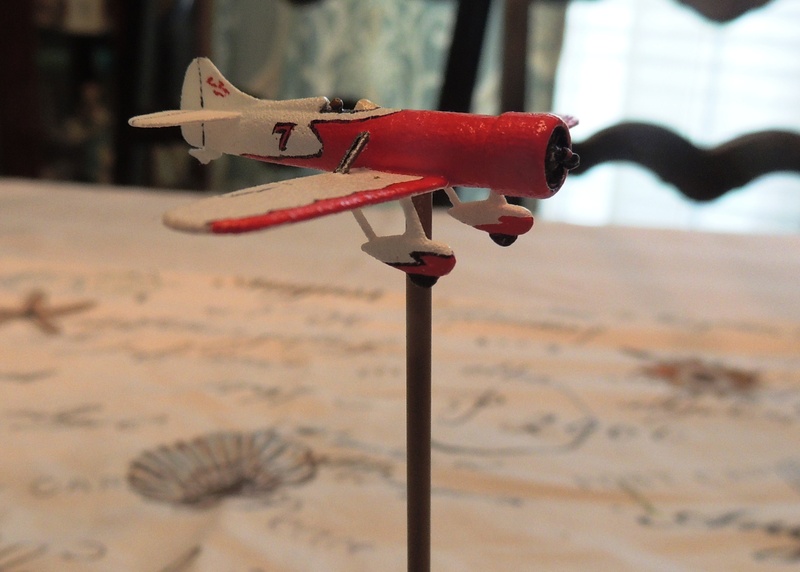 I’m pretty sure I’ll stick with the basics and paint in the detail with the help of Mendenhall’s The Air Racer.